I graduated from Bournemouth University in Computer visualisation and Animation with a first class degree in 2016. I’m proficient in several areas of the 3D animation pipeline, such as lighting, rendering, animation, pre-production, modelling, scripting (python, C++), technical animation (cloth simulation, hair/ fur dynamics with nHair) and rigging; I enjoy problem solving and have an artistic eye for detail, striving for realism in art, and innovation in technology. Please, take a gander around my website to see my work. Be sure to add me on linked in; click 'view more' below to my 'About' page were you can find links to follow me. 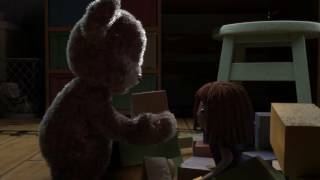 2016 Summer BFX competition, I did the rigging (bear, robot, teddy), pre-production, credits and animation (shots 1,2,4). See http://www.ellieansell.com/bfx-2/ for more detail. Getting a bit outdated now, but he's my old showreel. Since working at framestore, i've been programming (GPU shaders, clock and countdown logic for Samsung GS3, scripts here and there) https://www.framestore.com/work/samsung-gear-s3-world-choir See? I'm in the credits! I loved working on the team, though it was a huge learning curve for shaders and I practised on the website 'Shadertoy' a lot. One of my favourite hobbies: drawing. Leaking my imagination through the blunt plastic nib of a tablet pen and exploding on-screen. I can draw for hours; and surprise surprise, I do! Follow my Facebook page for updates (shown in the footer of this page) or see past artwork on my site clicking 'view more' below. Click here for my Vimeo.